WE ARE SEEKING 7 WORKERSHARES FOR THE 2018 SEASON! Scroll down to learn what to expect from being a workershare on our farm, as well as the varying expectations and schedules of harvest day and general workershares. A workershare is a volunteer who commits to working five hours per week (if you are a couple or pair of workers working together, it'll be four hours per week), April-Oct (full-season workershares) or May-Aug (seasonal workershares), in exchange for a CSA share. Workershares are needed on harvest day (Tuesday) or any other day of the week that suits their schedule. We prefer that workershares complete their hours in one shift rather than splitting it up into two days. In our experience, working a full shift increases efficiency, and every ounce of efficiency matters on our farm. What are the perks to being a workershare for Three Plaid? Our farm is a mere five minutes away from the Winfield Metra stop, and we can accommodate transportation to and from the train station. 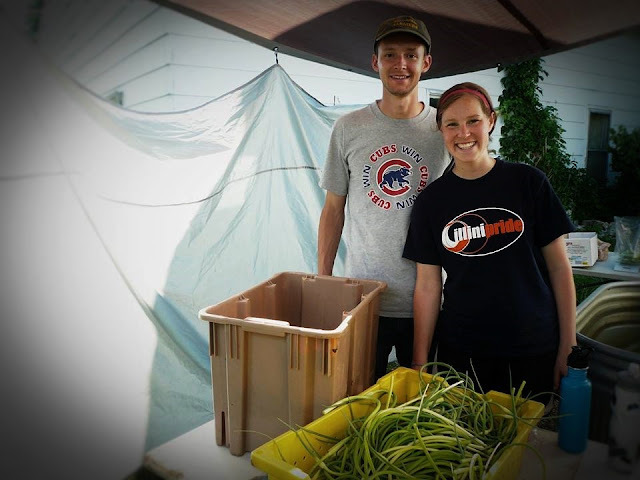 Workershares not only get a full CSA share, but often take home extras. As long as our CSA and other customers are taken care of, the workershare can take as much as they please home with them. You are the heart of our farm, so our bounty is your bounty! What to expect from being a workershare? You will need to be able to lift at least 50 lbs, work well with other people, and expect a lot of repetition and basically never-ending weeding (on non-harvest days). Workershares will need to be able to handle working in heat and humidity, mucky, wet conditions, amidst dog ticks and voracious mosquitoes, etc. We're telling it like it is, folks. Farming is a physically demanding and mentally taxing job. Harvest day workershares will be expected to work rain or shine. General workershares might be asked to switch days if the weather conditions aren't conducive to working in the field on their normal day. 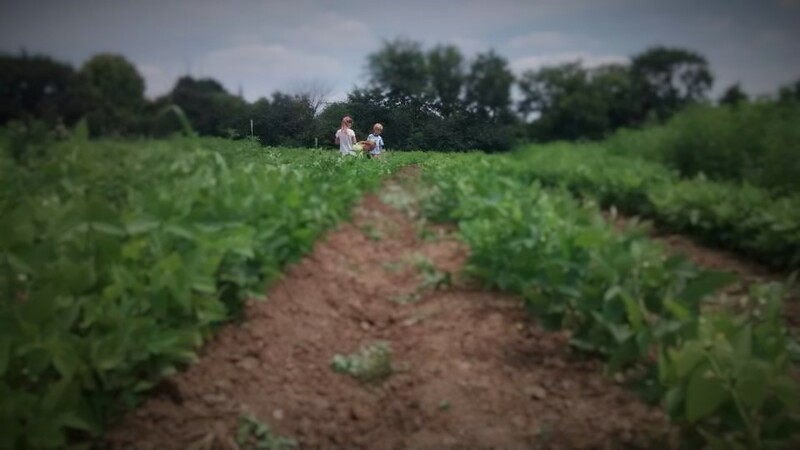 All workershares are expected to learn quickly and work to improve the efficiency on our small farm. What is the difference between harvest day and general workershares? Both Harvest day workershares and full-season General workershares start the season (April) helping with the same early season tasks--seeding crops in the greenhouse, direct seeding and transplanting, weeding perennial crops and early-season beds, laying irrigation, and removing straw from the strawberries. Seasonal workershares will pick up similar tasks starting in May. 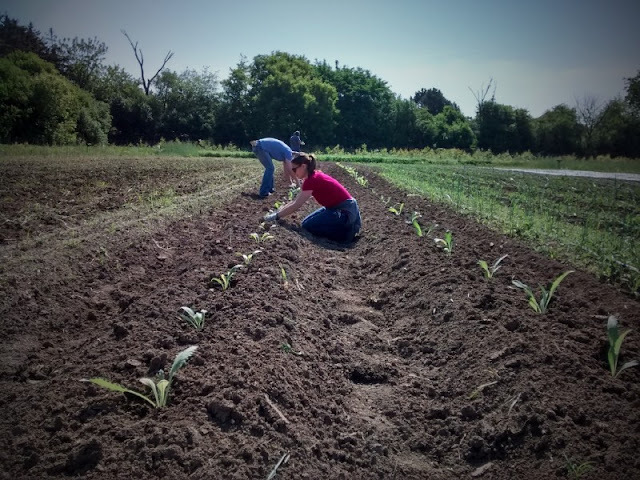 **From April through mid-June, harvest day workershares can choose any day of the week to help out on the farm, though we recommend choosing Tuesday to maintain a predictable rhythm at the farm--for your sake and ours. Annette--our loyal delivery workershare--and her hubs, helping us transplant artichokes and cardoon, Spring 2016. 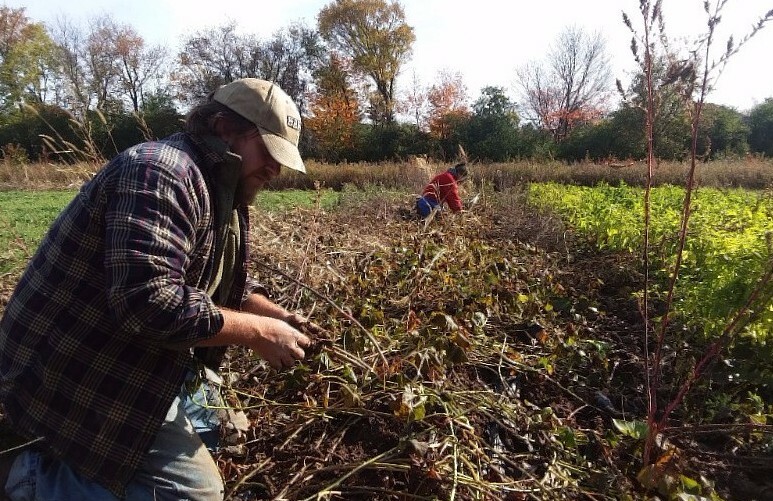 Starting in mid-June, Harvest day workershares are expected to come to the farm every Tuesday through the end of October, no matter the weather. Our harvest crew is responsible for helping the head farmer harvest, wash, and prep produce, and pack up CSA shares. We expect our harvest workers to pick up harvesting skills quickly and strive to work as efficiently as possible. Every minute counts on harvest day, and we expect our workershares will not slow that process down. 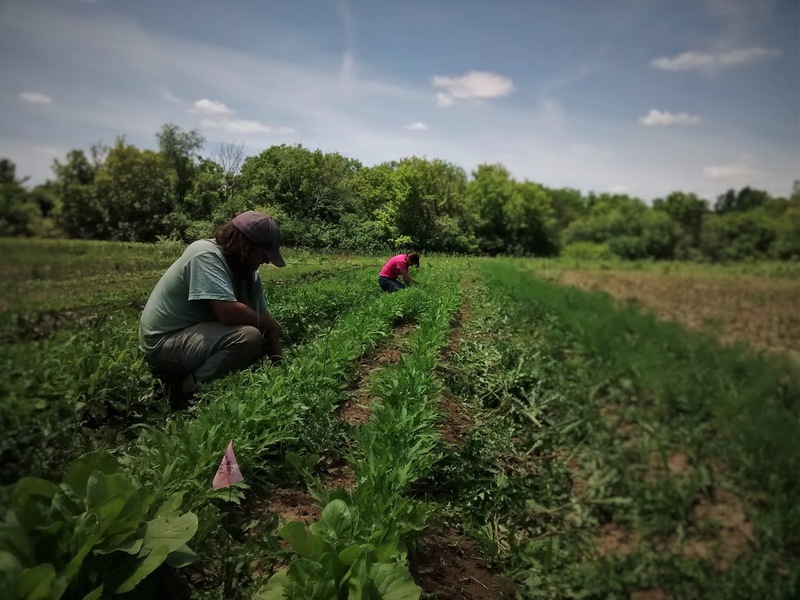 Starting in mid-June, General workershares (full-season and seasonal) continue weeding and assisting with seeding and transplanting, and will be divided into two groups--Herb/Flower workershares and Vegetable workershares. We expect our workershares to become familiar with the crops they are working with and alert the farmer to signs of stress (pest infestation or disease), providing invaluable input on the state of the crops in their respective areas. General workershares are expected to pick up weeding, transplanting, and seeding skills quickly and strive to become more efficient every week. Every minute counts on our farm, and we need our workershares to help us keep the farm productive. What does a workershare get out of the deal, aside from produce? Bragging rights that you are taking part in the local food movement (woot! 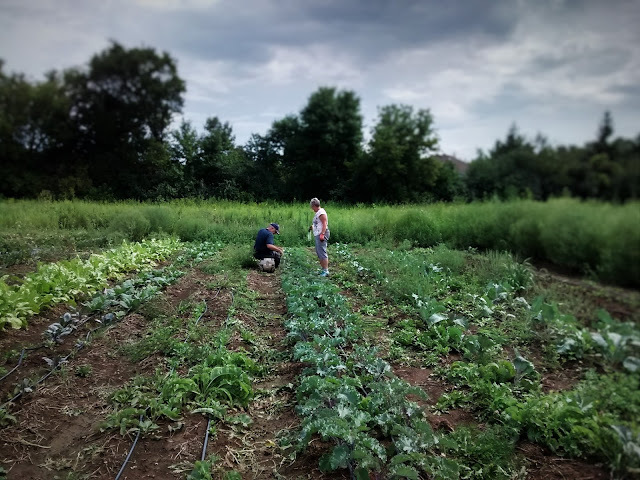 ), satisfaction that you're helping a local farm provide food for the community, and direct access to lots of knowledge about growing food and running a business; we've each been farming for about a decade and we're in our seventh season as a business. Please email us at threeplaid(at)gmail.com if you'd like to learn more or are interested in applying. We'd love to have you on board our team of badasses!